Our kids are stressed! A 2010 study by the American Psychological Association found that nearly half of America’s kids are stressed. The study found that more than one in three children report experiencing headaches in the past month, but only 13 percent of parents think their children experience headaches as a result of stress. In addition, while 44 percent of children report sleeping difficulties, only 13 percent of parents think their kids have trouble sleeping. In 2015, about 3 million teenagers from ages 12 to 17 had at least one major depressive episode within the prior year, according to the Department of Health and Human Services. More than 2 million teens report experiencing depression that impairs their daily functioning. According to data from the National Institute of Mental Health, about 30 percent of girls and 20 percent of boys (totaling 6.3 million teens) have had an anxiety disorder. Most kids spend the school year with packed schedules - filled with homework, after-school activities, extracurricular clubs, technology and inadequate sleep. Further, kids are dealing with bullying, hormonal changes, pressure from parents and teachers, and stress from navigating their social scene. All these factors combined put kids into an alert state on a daily basis. Most kids' brains are constantly stimulating the stress response, whether or not there is an actual emergency. When kids are constantly in fight, flight, or freeze mode, they have difficulty using their pre-frontal cortex. The pre-frontal cortex is the part of the brain that helps human's regulate their emotions, solve problems, make good choices and pay attention. When we are in stress mode, the alarm part of our brain becomes stronger and the logical, calmer part of the brain becomes less and less functional. For many kids, it is not camp that is stressful; it is that our brains that are wired to react to every situation with a stress response. For others, being away from family or in a new setting may trigger some sad or anxious emotions. Campers and counselors may experience a wide range of difficult emotions while at camp. Some emotions include anxiety or physical symptoms stemming from feeling homesick, anger and frustration from poor sportsmanship, or sadness and loneliness from having trouble making friends or fitting in. Camp directors and staff are facing challenges when it comes to helping kids and counselors cope and manage their emotions. 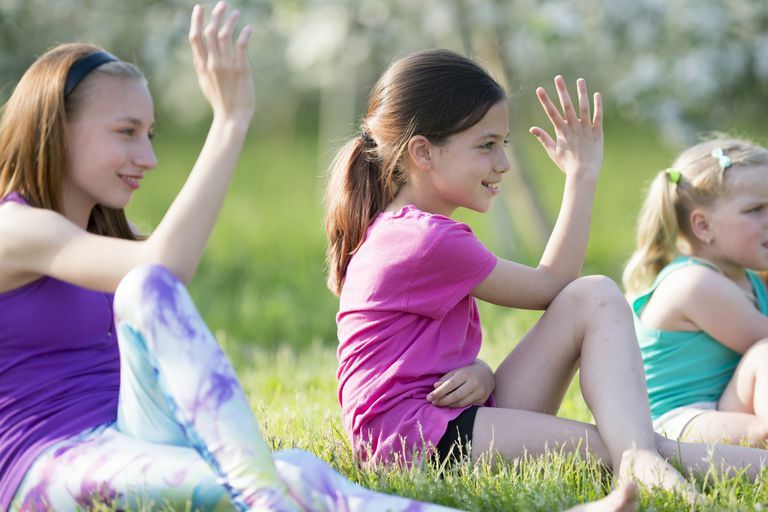 With statistics like these, it is no surprise that summer camps are incorporating mindfulness and yoga into the summer curriculum with the hopes of creating a positive, well-rounded camp experience. The goal of mindfulness is not to eliminate all stress in life. Some stress is useful and necessary. The goal is to teach campers and counselors how to be resilient in the face of constant stress. Research shows that mindfulness stimulates the pre-frontal cortex of the brain and makes it stronger. Mindfulness teaches kids to calm down and regulate their emotions. Mindfulness is defined in many ways. Mindfulness for kids may be different than for adults so your mindfulness practice may be very different than what your child is learning in camp. Mindfulness for kids may be programs that help teach problem solving and community building activities. Kindness and compassion are cultivated in a nurturing, positive, and supportive atmosphere. There are many ways to teach mindfulness to kids, including games and activities. Programs also introduce and teach body, breath, and spatial awareness. Yoga may also be part of the program. The main goal is to give kids the skills to develop awareness of their inner and outer experiences, to recognize their thoughts and let them sit as "just thoughts," to understand how emotions manifest in their bodies, to recognize when their attention has gone elsewhere, and to provide tools to help control their impulses. There are various camps and summer retreats that teach mindfulness and yoga to kids. Similar to a sports camp, kids attending these special "mindful summer camps" spend their days practicing meditation and yoga. Other camps, both day camps and sleep-away camps incorporate mindfulness into their daily programs in different ways. "We started offering 'morning mindfulness' this summer as an optional activity for campers. We felt this would be a great way for our campers to start their day feeling focused, present and more self-aware. In this digital world we are living in, children need to find more time to 'unplug.' We provide kids a space to do this, since we have a policy that prohibits electronics and screen time at camp. We hope that once our campers come home, they can continue to take a break from screens and technology and just spend a few minutes focusing on themselves and their peers, and feel more connected." "Not only do campers practice yoga individually, we also engage in partner yoga, which exemplifies the Jewish value of 'V'Ahavta lareyacha kamocha'—loving our neighbors as we love ourselves. As the campers rely on each other to hold poses and balance together, they are literally embodying the concept of treating each other with respect and kindness. Yoga has been a wonderful tool to teach our campers about Jewish values as well as connecting them to their bodies and promoting self-care." "With a packed schedule, we make a point to infuse every camper’s day with periods of mindfulness, with classes including yoga, gardening and writing. These periods help our campers develop the ability to be calm, quiet and introspective; which we find helps keep the campers more focused throughout the rest of the day. The mindfulness skills that we teach campers also carry over to the school year, helping the kids stay focused and calm throughout the school day." Mindfulness can be taught in many different ways, but there are four practices that are important in any mindfulness activity. These are things parents can teach and practice at home with their kids. They are simple and will help reduce stress, increase happiness, and develop habits for wellness and resilience. Mindful Breathing: Mindful breathing is simply bringing your awareness to your breath. Breathing is at the core of a formal mindfulness practice. Breathing is also one of the best ways to calm the stress response in the brain. Breathing regulates the body; it works every time! Practicing mindful breathing strengthens then the prefrontal cortex and creates a calm state of mind by bringing your awareness to each time you inhale and exhale. Mindful Listening: Mindful listening teaches you how to pay attention. It helps you focus and be more productive with a less distracted mind. Mindful listening to sounds may be easier for kids than mindful breathing. Learning to listen mindfully allows kids to filter out thoughts about the past or the future and just focus on right now. Body Scanning: Body scans help children pay attention to their bodies and learn to relax different muscles. Body scanning is teaching children to notice how their body parts feel at different times of the day. Children learn to accept how their body parts feel without trying to change those feelings. It is important for kids to recognize sensations they may have in their belly, legs, arms, head, hands, etc. These feelings change through the day and that is okay. Paying Attention to Emotions: Teaching kids to pay attention to their emotions is an important and difficult skill. Everyone has positive and negative experiences throughout the day. Bringing conscious awareness to positive experiences will help create a positive outlook. However, we all experience negative emotions as well. We all make mistakes or have bad days. Teaching kids to accept these negative experiences is an opportunity for growth. As parents, when we think about summer camp, we think about calmness, nature, and fun. While this may be the situation for many children, there are others whose stress, anxiety, lack of resiliency, and negative emotions get in the way of having a great time at camp. Teaching children how to be mindful has many benefits. Learning to be aware of one's feelings, movement, and breaths without judgement will help regulate emotions, increase empathy, strengthen impulse control, increase attention span, and help teach soothing skills.